The term “Varanida” comes from the official scientific designation for a monitor lizard, the Varanidae. This genus got the less formal name “monitor” due to the way in which such lizards will sometimes rear themselves up on their front legs to get a good look around, to monitor their environment, as the little fellow in the Varanida logo seems to be doing. The omnivorous appetite of these creatures has given them a reputation for cleaning out mangroves and fields. Thus, they are a suitable mascot for a technology designed to clean out the messy internet marketing ecosystem. Accordingly, in this newly announced project, Varanida, a company based in France, promotes a Verified Ad Program (VAD) in an effort to redefine internet marketing, using blockchains for their decentralization, fraud-resistance, and transparency. Varanida has developed an add-in or extension for Google Chrome and Mozilla Firefox browsers. The extension will allow the internet user, including one with no technical sophistication, to block irritating internet ads, as detailed in their White Paper. That idea isn’t very surprising, there are lots of ad blockers out there. What is more important, the user of Varanida’s extension, in blocking ads for him/herself, is helping to block them for a broader network of users as well (which might be a satisfying fact in itself) and is earning tokens with real near-term uses. We’ll get back to those points soon enough below. The CEO, and one of the founders of Varanida, is Anji Ismaïl, a blockchain enthusiasts who advises on a number of blockchainprojects, and who has created a cryptocurrency mining operation. Varanida is a new expression of Ismaïl’s established interest in internet marketing. He is also the co-founder of DOZ.com, which he once described to Venturebeat as “the Uber of marketing campaigns.” The idea behind it was that a website owner should be able to order up a marketing campaign remotely, from the cloud so to speak, from marketers who (like Uber’s drivers) are paid per task. The restructuring of Varanida has a much broader scope and purpose than that of DOZ but it is in the same line of progress. And one of Ismaïl’s co-founders is Faouzi El Yagoubi (also a co-founder of DOZ). The other is Thomas Schmider. El Yagoubi is the chief technology officer, Schmider (whose resume includes the co-founding of Infogrames, the company that in due course purchased Atari) is the chief operating officer. The other members of the managerial team include three distinguished software engineers: Pierre Antoine Meley, Mickael Crozes, and Marc Vicenti. Meley has an electronics, information tech, and signal processing background. Crozes, who has a masters in computer science from SUPINFO International University, comes to Varanida with a lot of technical infrastructure experience at Amazon.com. Vicenti has a background in artificial intelligence and signed his first transaction with the Bitcoin Mainnet in 2012. Also on board: Mathieu Sibille, senior vice president of business development (with experience in APAC, EMEA, and eastern Europe) and Jon Lord, senior ad tech consultant, who managed international sales and account teams at TradeDoubler and, more recently, worked at Criteo, a company that provides personalized online display advertisements. Varanida’s line-up of early investors and advisors displays a valuable range of backgrounds and new/social media savvy. These advisors include, for example, Joel Comm, the bestselling author of The AdSense Code (2006) and Twitter Power (2009). Also: Jean Christophe Conti is in. Formerly he was VP and head of the partnerships group at Yahoo where he was in charge of all partnerships, both desktop and mobile, in EMEA for: the Yahoo Display Ad Network, Yahoo Search Affiliate Network; and Right Media Platform & Exchange. of Sales for the Publishers Business Unit EMEA at AppNexus. More recently, Conti has been VP of Sales for publishers business unit, EMEA, at AppNexus. Further, there’s Thomas Hessler, an early blockchain enthusiast and a co-founder of former CEO of Zanox, which under his leadership grew to become a global market leader in performance based online marketing until, in 2007, it was acquired by two media giants Axel Springer (Germany) and PubliGroupe (Switzerland). We’ll mention just one more name from this field: Frédéric Montagnon is an early investor in and advisor to Varanida. Its white paper describes him as “a very active angel investor in various technology sectors.” He launched both Secret Media (an ad blocker monetization company) and Legolas Exchange (a decentralized crypto-exchange). This January Legolas raised more than $35M through its ICO in January 2018. But let us return to what these individuals, combined in the persona of a lizard, are up to. The Varanida white paper looks at a number of the problems that now attend internet advertising from three different points of view: that of the users, the advertisers, and the publishers of internet content. Most users surveyed (91%) agree that ads have become even more intrusive than they were just two or three years ago. Users don’t necessarily believe that ads are bad, but the clutter of ads makes it difficult to distinguish which ones might actually be offering something valuable. Also, users are concerned that they’ve lost control over how their personal data is employed once it is ‘out there’ on the net. Indeed, most users (86%) say they have taken steps to remove digital footprints because they don’t like being targeted and pursued by the demographic characteristics and interests they have displayed. From the point of view of the advertisers, of course, “banner blindness,” the condition in which users have learned to ignore ads and focus on content, is undesirable. Marketers want their ads to reach people, and not merely to be there on the screen. The average click-through rate for a banner ad is now around 0.05%, which is enough to make one nostalgic for the ‘90s and grunge rock. From a publishers’ point of view, too, the system is broken. Two fifths of publishers report that their ad revenues are now static or declining. They face a problem of scaling. Only a small number of publishers have the technical capabilities or the audience size necessary to serve the needs of the large advertising clients. The advertisers know this and are increasingly avoiding the small and even medium sized publishers. So even though more money than ever before gets spent on digital advertising — if a publisher isn’t Google or Facebook, it probably isn’t getting much of it. Meanwhile, younger users (the most desired eyeballs in the system) have caught on to the availability of ad blockers, which the Varanida white paper calls “the publishers’ nightmare.” Ad blockers now on the market don’t give users a lot of control, they aren’t customized to let users view what they would regard as useful advertising while blocking the rest. For the reasons mentioned here, and others, it is clear to the people driving Varanida that internet advertising will have to change. Their goal is to mold that change. The underlying idea is that Varanida will but itself in the center of this triangle of dissatisfied parties: users, marketers, and publishers. Users will agree to look at high-quality advertising, and will receive VAD tokens when they do. So the users win. Advertisers and publishers will each pay a network fee. But they also win, because the new system will solve their problems as discussed above. Publishers — except presumably for Facebook and Google, which might both want to preserve their unique status under the present system — win by paying a fair value price for their advertising and preserving their engagement with the audience. The advertisers win by getting a fair and transparent advertising network. Blockchain technology is the key is achieving all this. As the white paper says, the prototype will work through the Ethereum Network, which the managing team considers the best network available at this stage in the development cycle for blockchain technology. But they will be developing their own blockchain at the same time. They have several solutions to achieving that goal under consideration, and they will be “communicating our test results as well as our final decision” on the basis of the Varanida Blockchain. However the particulars are ironed out, the idea is to deploy “a crowdsourced advertising validation through the validation by users of the quality of the advertising.” This will be a fraud-proof system, allowing for trust within the triangle of parties just described. The network fees will be a minute portion of advertising spend. Publishers will be earning more money from the ads they show than at present, because getting onto the Varanida network will mean cutting out the middlemen. As noted above, the prototype phase involves the VAD token, an ERC-20 token on the Ethereum Blockchain. Users will agree to view ads, and will decide to block certain of the ads, those they deem low quality, from the network. Every time a user blocks an ad, he or she is to be rewarded with a token. Thus, they will be contributing to a list of blocked ads and advertising scripts stored on the blockchain. Over time, too, VAD tokens will become tradeable for other cryptocurrencies, and for fiat currency. Publishers will also earn VAD tokens based on an auction to take place on a Real Time Bidding platform, so anything they receive from users as described above will be in the nature of a “tip” for reward-worthy content. Publishers, in turn, will be in a position to offer VAD tokens as incentive for comments on articles, for sharing on social media, or for contributing additional content. June 26, End of Round 0. Private re-sales had offered 50% discount on tokens. In terms of ratio to bitcoin this meant 0.00000570 BTC/VAD. The result was the sale of 1.46% of the total token supply. June 27, Round 1, an invite-only round, [though the interested are invited to request an invite] begins. The minimum contribution for this round is 3 BTC, or 30 ETH, and the target is to sell 30.15% of the new tokens. They’re selling at a 30% discount, or 0.00000900 BTC/VAD. Click here to request an invite. August 15, Round 2, sales open to the public, begin. The public of course is subject to know-your-customer rules. The discount is down to 10%, and the target is the sale of 20.10% of the tokens. September 15, Round 3, also open to the public. No discount. There is no fixed date for the end of Round 3. Varanida expects to sell a total of 67% of its tokens in these rounds. As to the remaining 33% of the tokens, their distribution shall be as indicated in this graph. does not qualify as a payment service within the meaning of EU Directive (2007/64/EC) of 13 November 2007 relating to payment services in the internal market, nor within the meaning of the (EU) Directive relating to payment services 2 (DSP 2) N° 2015/2366 of the European Parliament and of the Council of 25 November 2015. Since the troubles associated with internet advertising are not secret, it is unsurprising that there have been and still are other projects aimed at addressing those troubles, Further, some of those other projects, like Varanida, employ blockchain technology. We’ll focus here precisely on those, the more direct, competitors. AdEx, ADX, for example, is a blockchain based ad exchange, created with the expectation that decentralized apps (Dapps) would be build on top of the exchange. Basic Attention, BAT, is the token associated with Brave, an open source browser blocking ads and trackers. 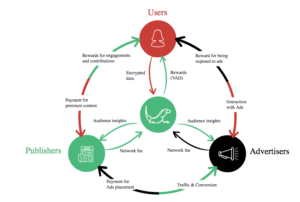 BAT includes a ledger system that anonymously tracks user attention to reward publishers. But Varanida is importantly different. Both ADX and BAT have centralized the ad blocking function. Advertisers understandably dislike centralized blocking, which they believe essentially involves holding their work for ransom. But Varanida wants to bring the advertisers on board as part of its three-sided system, and to this end Varanida’s system is transparent and decentralized with regard to its ad blocking. Advertisers can buy in, in the belief they’re getting a fair shake and that they can learn and benefit from the feedback they receive through the network. Also, the Varanida system includes a reputation management feature that is not matched by ADX or BAT. The Varanida platform will “introduce a specific score presented in the form of VADkarma.” Advertisers will build up their VADkarma by proposing high quality ads. Publishers will build up theirs by displaying those ads on websites that meet Varanida’s guidelines on quality, Users, too, will have a VADkarma score, to which they will add as they rate both ads and the quality of websites. For users, the direction of the score will move only upward, there will be no mechanism by which a user’s score can drop. But for publishers and advertisers, loss of VADkarma will be possible. The idea is to deter the creation or placement of spam. Some readers might not be familiar with the phrase “boolean choices,” so here is a very brief tutorial. Boolean algebra is the branch of algebra in which the values of variables are “true” or “false,” usually represented as 1 and 0. The operations of Boolean algebra are AND, OR, and NOT. Thus, George Boole, writing in the 1840s, unwittingly laid the groundwork for the formal description of the operations of a digital computer. Boolean choice here simply means that users reacting to an ad are doing something binary: thumb up or thumb down on the ad. These binary choices are then aggregated so that there is a binary choice at another level: the ad is either deemed approved or rejected. After the process is complete for a particular ad, that advertiser’s reputational score is either increased or decreased. The white paper might have been more forthcoming about the competitive challenges that Varanida will face. For example, Papyrus (PPY), a scalable blockchain protocol with many of the same expressed aims as VAD, seems a closer kin than ADX or BAT. Yet, although PPY is mentioned in the blockchain, it is only just barely mentioned, with a specific opinion, much less a cogent distinction. It would have been a suitable matter for further comment. Nonetheless, the bottom line is that VAD enters the market to use blockchain technology to fill a need, straightening out the mess that is internet marketing in the later part of the second decade of the 21st century. The mess is real, and the arrow aimed at it seems the right one. The market for those arrows may be large enough to accommodate a number of archers.